CIMSEC has a post, “DESIGNATE THE 9TH NATIONAL SECURITY CUTTER AN ARCTIC FLAGSHIP,” which suggest essentially two related actions regarding the recently funded ninth Bertholf class National Security Cutter (NSC). As usual, the benefits of cutting transit time by basing ships in Kodiak are overstated because the need to transit south for training and yard period is neglected. Individual training is also easier and less expensive if the ship is located near training facilities. I find the case for ice strengthening a bit more interesting, but do we really want to redesign a ship that now benefits from the maturity of its design? The author also touts the advantages of light icebreaking done by an ice-strengthened NSC, perhaps not realizing that icebreaking is already done by 225 foot buoy tenders, four of which are homeported in Alaska, including one in Kodiak. It really looks like the OPC would be a better choice for homeporting in Alaska, being simpler and already planned to be ice-strengthened, but it is also true that the ninth NSC will be finished at least a couple of years before the first OPC and probably several years before an OPC will be homeported in Kodiak. This entry was posted in Alaska, Arctic, icebreaker, NSC by Chuck Hill. Bookmark the permalink. I have been on the NSF ice strengthened ship Palmer. And watched as the Navy tried to get a T-AGS ice classed. It is far easier said then done to take the current NCS hull design and structure and convert into ANY kind of an ice strenthened ship. Don’t believe any sales job that HII spins. 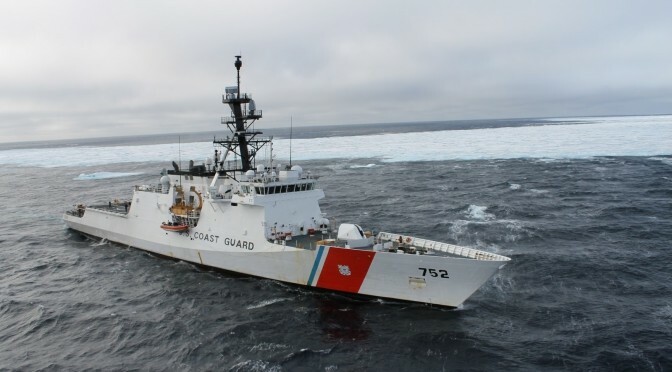 More importantly IF the USCG wants an a ship to patrol and command to remain for long periods in the Arctic based from Kodiak, than please consider a different ship type. Noting that chartering an ice strengthened ship for Arctic ops is timely and cost effective. MSC has done those before, and there are certainly a number available on the market today. Crew can remain, while mission personnel are flown to/from Kodiak. Even getting past the hull modifications for light icebreaking, IMO the shore side logistics required to support a WMSL is so massive, I don’t know where they think they’re going to put it all. The MAT team in Kodiak is only about a dozen people, and even if you added billets, there’s just not that much room. That’s not even addressing the small boat issues, or the near constant dependance on MTU for everything beyond basic maintenance, which is itself a major long term issue, albiet one for an entirely different discussion. Think about an afloat forward logistic support ship – chartered by MSC, crewed with civilians, accommodations for military and scientists, spaces for techrep and shops for special M&R. Cranes for boats and big lifts. Helo pad adds to price but doable. Not hard nor expensive to do. I did a FMS barge like that in Diego Garcia.